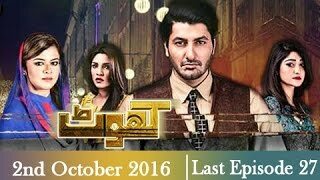 Khoat is a story that revolves around Javed Ayaz ( Jibran Khan), a hypocrite who flirts and deceives others for his benefit. He belongs to a lower middle class family; but his goals are higher and in order to achieve them, he fools different women at different stages of his life.Maira (Nida Khan) is Javed�s first wife who truly loves him but gets nothing in return. He pretends to love her but his only motive behind the marriage is her money.Cast :Jibran Khan as Javed AyazNida Khan as MairaZhalay Sarhadi as SunainaMaria Wasti as Shagufta and others.Writer: Imran NazirDirector: Amin IqbalTiming:Watch Khoat every Friday at 10:00 pm only on ARY Digital.